When I sent cards to the CFL as part of a blitz package, the league was kind enough to send me more cards with autographs on them from the Jogo 1992 set. Most NFL fans probably don’t have a clue who Alondra Johnson is but that’s okay because he blazed his own trail North of the Border terrorizing offenses for 16 seasons in the CFL. A 2009 CFL HoF inductee, Johnson (from West Texas A&M) played in 6 Grey Cup Championships winning three (1992,1998, and 2001) with the Stampeders. 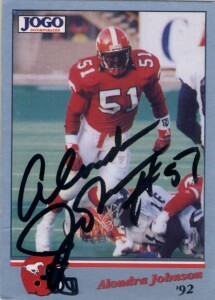 Originally signed as a free agent by the British Columbia Lions in 1989, Johnson would play for them for three seasons before he signed with Calgary in 1991 playing for head coach Wally Buono. 1998 would be punctuated by Alondra getting the CFL’s most valuable defensive player award and in his career he’d be named a 6 time Western All Star and 3 time CFL All Star. He’d suit up for the Stamps an additional 12 seasons and a final one in 2004 with Saskatchewan. In 2007, Johnson signed a one day contract to retire as a Stampeder. At the time of his retirement, Alondra’s 1095 career tackles ranked second all time in CFL history. In 2005 he was inducted into the West Texas A&M Hall of Champions, and in 2010 he was inducted into the Stampeders Wall of Honor. Johnson once described his playing methodology as, “Speed-times-force-times-mass equals serious punishment.” At last glance Alondra is living in Los Angeles, planning his next move.